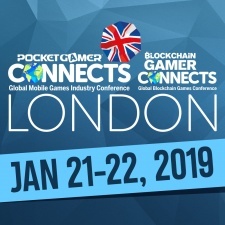 Last week’s Pocket Gamer Connects conference at The Brewery in London more than lived up to expectations as the biggest dedicated mobile games industry show in Europe, not to mention the biggest B2B games show of any kind in the UK. Over the two days over 2,350 delegates from c.1,200 companies (and 54 countries) wandered the halls of The Brewery, exploring an expo area packed with more sponsors and exhibitors than ever before (c.100 tables and booths), listening to 297 speakers delivering 96 hours of content in 198 sessions over 25 distinct tracks and ultimately getting down to business in 8,593 scheduled meetings. Whilst the show increased on all metrics from 2018’s outing, the number of organised business meetings was particularly dramatic in its increase, underlining the point that despite the relaxed, fun atmosphere, this is at its heart a practical show. Indeed, adding in the fringe events (such as SpeedMatch developer-publisher, Investor Connector and Big Indie Pitches) plus an estimate of self-organised meetings conducted either at the venue or the after-party, and that number will comfortably top 10,000. Although it's notoriously difficult to put an accurate pound value on resulting deals and transactions, we have already been informed that several multi-million dollar term sheets are changing hands and with publishing, investment, user acquisition campaigns and other services we’d expect the value of resulting business inked to ultimately be north of £100 million. As usual at Connects conferences, the event intentionally comprised a genuine cross-section of the ecosystem, with indies and student developers rubbing shoulders with C-level execs from the biggest triple-A publishers and investors, plus every key tool-maker, service company, platform and consultant also present, as well as the usual press core. The content line-up was similarly diverse, with dedicated tracks for everything from UA, monetisation, investment, company culture and cloud games, to esports, influencer marketing, hypercasual games, live ops, development tools and techniques, and global market opportunities. As for gaming formats, whilst mobile games formed the heart of the event (as you’d expect from Pocket Gamer and for the largest part of the modern games industry), there was also a strong presence for PC thanks to the growing PC Connects sister conference, embedded alongside with its own track talks and pitch events. The emerging blockchain technology space was equally well-represented as the latest Blockchain Gamer Connects event brought together many of the leading developers, platforms, tools and investors to debate the hottest issues. The XR world, console publishers and esports were all in attendance too, with their own track elements in the form of Connects X and Esports Academy tracks, and there was even a look ahead to emerging platforms such as audio games. Steel Media CEO Chris James was understandably overjoyed: “We set out to build games events and media that made a real difference to the industry and I feel confident we’re delivering on that. I thought we’d struggle to top last year’s London event for volume of people, quality of content and overall ‘games industry family’ atmosphere but I was totally wrong. "Obviously the credit needs to go to my incredible team – special shout out to Sally Kevan, Joao Diniz Sanches, Jez Bridgeman, Dave Bradley and Lisa Bissett – but also to the awesome companies and individuals that has supported our vision to deliver something special, either with sponsorship, sharing information as speakers or just coming along. True to James’s words, Connects London may have been the biggest show Steel Media has yet delivered, but it certainly won’t be the last, with four more Connects planned for 2019: Seattle (May 13th to 14th), Hong Kong (July), Helsinki (September) and Jordan (November). You’ll be hearing a lot more about these and other Steel Media events in the coming weeks. To discuss sponsorship opportunities at future events, please contact Chris at [email protected]. To submit a speaking or panel suggestion, please visit the official submission form.